There was a voice missing when politicians from three of Ontario’s four major political parties fought for students’ vote last Friday at Humber College North Campus. 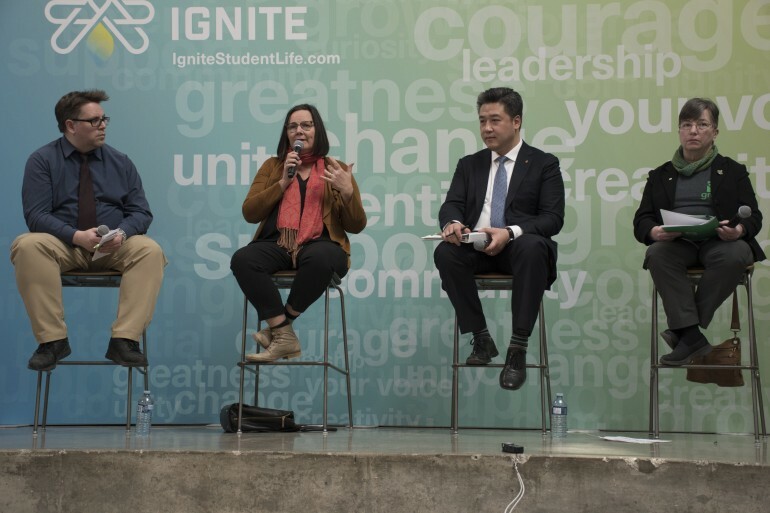 The Student Centre stage was taken by candidates of the Ontario Liberals, the New Democratic Party candidate, and the provincial Green Party, who promoted their platforms in what seemed to be a warm discussion. Noticeably missing was a representative of the Progressive Conservatives. The Panel left the Progressive Conservative Party chair empty. Simmer Sandhu, the candidate and former University of Guelph-Humber alumnus, canceled the afternoon before, according to the event’s organizers. Han Dong, the sitting Liberal MPP for Trinity-Spadina riding, used his policy knowledge and statistics to defend his ruling party. Pauline Thornham, from the Green Party, opted for the platform to promote environmental and social values. Sandy Shaw, the New Democratic Party candidate for Hamilton West-Ancaster-Dundas riding, strongly promoted students’ interests and countered Dong on several issues. “It seems to me that there is no more contribution to the entire funding for colleges and universities, while we’re making tuition free for certain people that actually is not an increase contribution to the sector,” Shaw said criticizing the current government. Moderator Adam Donaldson, of Guelph Politico, asked the three what their parties could do for students, Shaw criticized the current government again. “Students contribute so much for our community and they are our future, and I don’t think they’ve been well served to this point by some of the governments that we’ve had in place,” Shaw said. Dong cited the top three issues for students that he heard overwhelmingly at legislature: tuition, mental health stress and anxiety over finding jobs after graduation. “In the last few years, the government has taken bold initiatives in address this concerns,” he said. Thornham said proposed eventual free post-secondary education, tuition fees regulation, and an increase on funding and resources for food security programs to supplement mental health and poverty reduction efforts. Shaw said the NDP understands the contribution that international students make to Canada’s economy. “There are many ways and provisions that should be put in place to make sure that if you’re an international student, you’ll transitioned more easily into our communities,” she said. Last term’s five-week faculty strike still resonates among students. Dong defended the government’s handling of the strike saying the Liberal Party believes the best way to come to agreement is let the employer and the union who represent the employees to negotiate. “We believe there’s a great value in collective bargaining,” he said. How Ontarians vote was also an issue. Thornham said the Green Party also believes electoral reform would make things much fairer and reduce the impact of the first-past-the-post style of elections in Canada. “We wouldn’t have to be holding our hands and hoping that somebody that doesn’t get the majority of the votes actually gets all of the power,” she said.